Former British Prime Minister, Tony Blair, committed the UK to joining the US invasion of Iraq a year before it began, a newly disclosed White House memo reveals. The US documents obtained by the Daily Mail and published on Sunday are part of the batch of emails from the private server of former US State Secretary, Hillary Clinton, which US courts have made her disclose. Among the leaked papers is one written in March 2002 by former US Secretary of State Colin Powell to then-President George W. Bush, where he said: "On Iraq, Blair will be with us should military operations be necessary…He is convinced on two points: the threat is real; and success against Saddam will yield more regional success." The document was written a week before the famous meeting between Bush and Blair at the Crawford ranch in Texas, where the latter for the first time signaled his readiness to support military action in Iraq. Five months after the meeting at the Crawford ranch, the British government published a dossier on Iraq’s alleged weapons of mass destruction (WMD), claiming that Saddam Hussein possessed chemical and biological weapons and even had a nuclear weapons program. This dossier was one of the reasons for US invasion to Iraq and later all its claims were proved to be false. The new revelations sparked a wave of criticism of Tony Blair’s actions among the British politicians. “The memos prove in explicit terms what many of us have believed all along: Tony Blair effectively agreed to act as a frontman for American foreign policy in advance of any decision by the House of Commons or the British Cabinet,” said former Conservative Shadow Home Secretary, David Davis, as quoted by The Daily Mail. 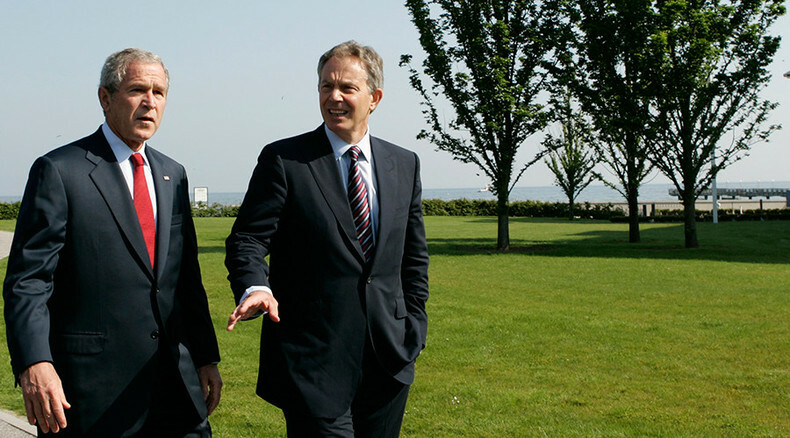 “He was happy to launder Bush’s policy on Iraq and sub-contract British foreign policy to another country without having the remotest ability to have any real influence over it … for George Bush pretending Blair was a player on the world stage to impress voters in the UK,” he added. Scottish National Party foreign affairs spokesman and the former Scottish First Minister, Alex Salmond, said on Sunday that “the evidence against Blair is piling up” and the “net was now closing” around him, eported the Guardian. “The memo contradicts claims from Mr Blair that all that time he had been seeking diplomatic ways to avoid an invasion. It also adds weight to the evidence given by Sir Christopher Meyer, the former UK ambassador to the United States – to the Chilcot inquiry – that the military timetable and preparation for invasion took precedence over any diplomacy and specifically over the timetable for the weapons inspectors led by Hans Blix,” Salmond said. "The illegal invasion of Iraq has been unequivocally proven as a fraud and a massive deception by Tony Blair and the then UK Labour government," he said as quoted by the Mail. At the same time, Blair’s spokesperson claimed that the content of the newly revealed documents corresponds with both the former prime minister’s public statements at that time and to what he told the Chilcot inquiry investigating the circumstances of the 2003 Iraq invasion. However, Blair previously repeatedly denied that he was planning military action in Iraq before the invasion. In 2010, Blair told the inquiry that, before the invasion, he said that the UK would only join the US “in confronting and dealing with this threat” referring to Iraq. "I think what he took from that was exactly what he should have taken, which was if it came to military action because there was no way of dealing with this diplomatically, we would be with him," Blair told the investigation. The newly disclosed documents could potentially lead to calls for reopening the inquiry into the circumstances of the Iraq invasion, although the chair of the investigation, Sir John Chilcot has recently announced that he was ready to publish a final report. At the same time, he continues to avoid announcing an exact publication date. Last month, Chilcot said he would consult with Prime Minister David Cameron in order to set a timetable for publication. In the meantime, relatives of British soldiers that lost their lives in Iraq threaten to file a legal complaint if the report is not published by December, BBC reports. The UK participated in the US-led coalition that invaded Iraq in 2003 without a UN mandate on the premise that they would find WMD, although such weapons were never discovered there. The invasion and subsequent occupation claimed the lives of more than half million Iraqis only between 2003 and 2011 and cost the UK lives of 179 British soldiers.